Proper storage of your lane lines is critical when you aren’t using them. When you are dealing with lane markers in the swimming pool, you will need to care for them and have a place to store them. While these lane lines are critical when you are swimming competitively because they stop the wave action, which can slow you down, you won’t always have them in the pool. Having proper lane rope storage is important. The Antiwave Ultimate storage reel can be a great asset. When you are completing certain training exercises or are using the pool for a free swim, the lane lines will only get in the way. During the colder months when the pool isn’t in use or when you are cleaning the pool, the line lanes need to be removed. When you remove those lane lines, you can’t just throw them in a storage closet or in a pile in the corner of the pool deck. This will cause damage and can lead to mold and other problems. Having a storage reel for your lane lines will work best. The Ultimate lane line storage reel from Antiwave can accommodate enough lane lines for an entire pool. The reel features a 6-inch spindle that will help prevent damage to the discs regardless of which size discs you use. This storage reel can store up to eight lanes of 75-foot Forerunner lane lines, which has a diameter of 4.75 inches, or up to five lanes of 75-foot Ultimate lane lines, which has 6-inch diameter discs. This is a larger capacity than many other reels on the market. This best swimming pool lane rope storage provides you with a long list of additional benefits that make it a great choice. The reel is made from lightweight metal that allows you to move it easily, as well as reduces the shipping costs for you. It comes in pieces to also cut down on the costs of shipping it to you. The four wheels on the storage unit lock and rotate to help you move it around, as well as keep it in place when you are storing the lane lines. Storing your lane lines properly is important whenever you take them out of the pool. When you choose the Antiwave Ultimate lane line storage reel will provide you with storage for up to eight lines, depending on the diameter of the discs on your line. 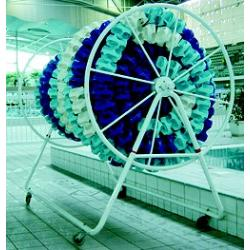 This is the best swimming pool lane rope storage due to its ease of use and capacity.